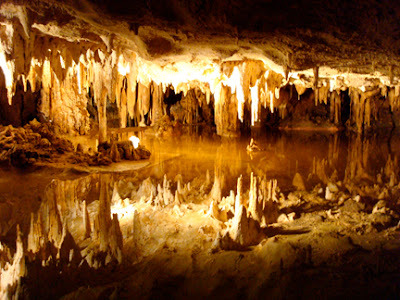 One summer our family toured Luray Cavern. Our guided tour took us deeper and deeper into the earth. As we walked the well-lit path, our leader pointed out the natural wonders on all sides. When we reached a level spot, he stopped beside a power switch and said, “Now I’m going to turn off the lights so you can experience absolute darkness.” As he hit the switch, the deepest black I’d ever known settled around me. Sheer terror began to suffocate me. Just when I felt I couldn’t endure another second there, I recalled a scripture I’d memorized. A still, small voice seemed to remind me, God hath not given us the spirit of fear; but of power and of love, and of a sound mind (2 Timothy 1:7 KJV). I realized then that the overwhelming fear that gripped me wasn’t from God, and He didn’t want it to control me. In fact, he had something to give me in its place. As I asked Him to take away the spirit of fear, it immediately vanished. A feeling of peace swept over me, and my panic was gone. In short, I was fine. Ever since then when fear attacks, I focus on 2 Timothy 1:7. Fear may nip at my heels, but I don’t have to let it overwhelm me. God is so good. He doesn’t want us crippled by a spirit of fear. He wants us to overcome that feeling through His gift of power, love, and a sound mind. Father, thank you for being with me when I am afraid.